The hosts go over some preparedness resources. The hosts discuss the purpose of 211 and the resources available there. The hosts advise a caller about evacuating from an area typically prone to flooding. AARP North Carolina hosted this Access Live event to help seniors in North Carolina put an emergency plan in place and provide other critical advice on stay safe before, during, and after the approaching Hurricane Florence. 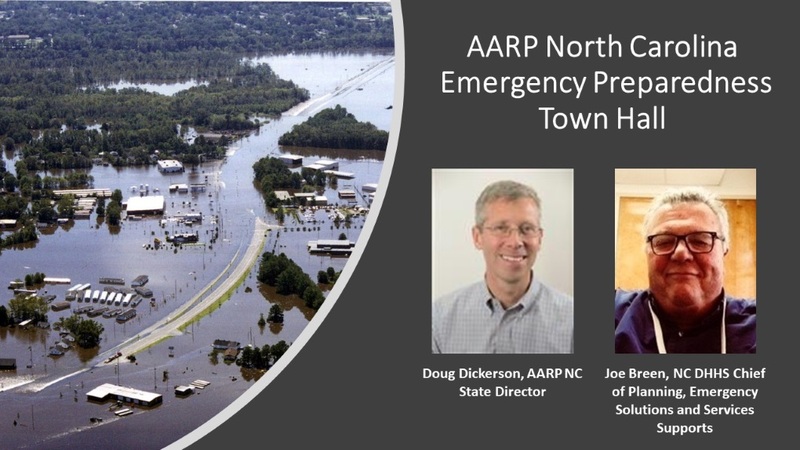 AARP North Carolina State Director Doug Dickerson was joined by Joe Breen, Chief of Planning and Emergency Services for the North Carolina Department of Aging and Adult Services. During the call, the two provided important last-minute emergency management information regarding the potential impacts on residents of affected areas. Hosts discussed important items to have ready in case of evacuation -- for instance, medication, medical equipment and insurance information. They also advised participants of the 211 resource provided by United Way, which people can dial if they need shelter, basic services, or other information about the hurricane. Hosts also recommended participants download the ReadyNC app, a resource provided by the state with all of the most up-to-date information about the storm.